Starting practice is one of the most precious moments. It can be very exciting and eventually leads to fabulous growth. Now is the very moment to decide if to go all the way through. When I started judo practice I decided, that I would have done it for the rest of my life and that my Master would have been a constant presence in my thoughts. Fundamental to the DO is one ingredient: COMMITMENT, indicating, that self-discipline and persistence must be kept regardless of how hard it is. Practice puts us under constant stress, but without it we would never be able to develop our personality. Commitment and self-discipline are precious as gold for those seeking the DO. More than 40 years later! When talking about “Judo Techniques and MMA” on my previous post I have mentioned, that the first record of such a situation concerns the father of judo himself: Who has not heard of the famous fight in 1889 between Jigoro Kano and a Russian seaman on the ship Ikawa Maru? Here the story in detail. On 13th September 1889 (22nd Year of the Meiji Era) Kano Sensei left the port of Yokohama to start a tour towards Europe in order to visit European Schools. His first stop was in China and after a short lay over in Shanghai the ship sailed off to the Old Continent. While there he went to Paris, London, Stockholm, Berlin and Amsterdam. Kano Sensei was very fond of learning about the European educational systems and wrote an ample diary on both the private and public school systems of all the nations he visited. While the ship was crossing the Indian Ocean, one day Kano Sensei went for a walk on the deck. He heard a group of people discussing loudly, they were engaged in a power challenge. A Swiss and a Dutch chap had challenged a big strong Russian seaman, who was holding an iron bar in his hands. They both tried to move him around, pulling and pushing, but with no success. Kano Sensei who was passing by, by chance got close to a Russian merchant and while watching the action said to him: “your countryman is quite strong, but I could pin him down and he would be unable to free himself!” The Russian started to laugh of course and went towards the strong seaman fellow to tell him the outrageous things he just heard. Also the seaman started to laugh, especially when he saw the frail little Japanese man and while making fun of him said: “ok little man, I accept the challenge!”. Some of the passengers started to shout: “Russia vs. Japan!”, others “Big vs. Small!” all laughing loudly. The Russian positioned himself with the back on the ground and Kano Sensei pinned him down. At agreed signal the seaman started to move, trying to free himself by pushing, pulling, turning, but to no use. The spectators started to look amazed and stopped talking when they saw this enormous man pinned down to the ground with no chance to escape by this small Japanese fellow. After a while Kano Sensei said: “ok, this is enough.” He let him go and got up. 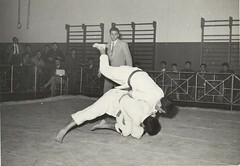 The Russian jumped up and went after him saying ferociously: “now it is my turn, you lay on the back and I pin you down! “. Kano Sensei answered: “ok” and put himself on the ground on his back with his legs slightly spread. The Russian pinned him down and at the agreed signal Kano Sensei was out of the pin in a fraction of seconds, turned the big opponent around and pinned him to the ground. After a while he let him go and got up, while the Russian was still panting. He shouted menacing him again: “you coward! You got out before I even had you down for real”. Kano Sensei started to laugh and said: “when your opponent is about to get you, do you wait until he closes up on you before you try to escape? You have to act right before total power is applied, this is the right time to escape and it is what I did. 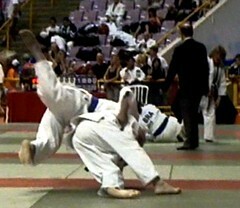 This is one of the basic principles of judo!” The Russian asked for a return match, but this time standing. “All right” said the Japanese “but this time with no resentment, whoever is going to win.” The seaman tried to attack him several times, but again without success. While waiting for the right moment Kano Sensei threw the Russian with morote seoi nage. All spectators were surprised and the Russian seaman himself went up to Kano Sensei to congratulate him. The ship on which this “unpublished” fight took place is the Ikawa Maru, which is docked in the port of Yokohama. Today it is a Museum on the water and on the ship itself a movie is shown of this fight to prove the truth of this episode. Kano Sensei had “mixed martial art” experiences, but always remained true to his origins, ideals, ethics and judo techniques. Enter your email address below and get regular updates on the Judo Universe.